 Proposition: Gell-Mann is a polymath. Polymaths can write about everything with authority. Well almost. The Nobel laureate in physics who coined ``quark'' and developed the ``standard model'' of particle physics continues to explore unified theories at the subatomic level of ``simplicity,'' so to speak. But here his concern is to make the leap to ``complex adaptive systems''--which means you, me, the jaguar, entire societies, and computers that can learn, etc. The result is a wide- ranging book, reflecting a mind that has never ceased to be curious and that has been able to indulge that curiosity through travel and contact with experts from diverse fields. 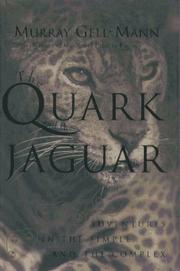 Thus, the book opens with a description of his close encounter with a jaguarundi--a wild cat- -in the Guatemalan rain forest surrounding the Mayan ruins at Tikal. The moment was something of an epiphany: Gell-Mann perceived that out of the simple and uniform emerge the complex and individual--the organism or system with a history, able to interact with the environment. The book plays out this theme in chapters that move from quarks and superstring theory to biological evolution, language development, culture, consciousness, creativity, and the present world ecological dilemmas. Along the way, the author offers introductions to theoretical constructs like measures of complexity, randomness, and depth; and he gives discourses on entropy and the arrow of time. All in all, this is a wonderfully heady experience. It is not particle physics made easy; it is an insight into the mind of an idealist and theorist--and polymath--whose company is a pleasure to share.